Since 2002, when he recorded in the atelier of Culture Factory Polymer disc “Segaja / Jammer” of Project Unison, Raul Keller has experimented with radio ether as an artistic material. In the project Artists in Collections sevaral previously important aspects for the author come together in a logical manner – electromechanical physical sound, radio technology, old recordings, electronic improvisation and analog noise. The focus of this endeavor is the 1938 acetate disc turntable Saja Synchron* by a Berlin company Sander & Janzen that at the time was the most modern and state of the art recording technology. The device allowed to record radio shows and music and to play them back later on the air. The public taping that takes place in the Estonian Broadcasting Museum is an homage to the renowned radio reporter Felix Moor, whose name is also linked to the development of Estonian dramatics to which he contributed as an actor, teacher of voice techniques, oratory technique and declamation, and as a consultant on acting and a stage director in both Estonia opera house and in the Estonian Broadcasting. In order to recreate the radio studio and produce a so-called live physical recording, Keller involved Kalle Tikas. The performance of Raul Keller will produce a radiophonic piece that deals with radio as the signal and radio ether as a physical material, it will contain both historical radio sounds as well as signals and impulses generated on a modular synthesizer. The cut acetate discs have its fixed lifespan – they suffer from wear with each listening, which changes the disc’s signal and noise ratio each time, signal fades and is replaced by the physical noise coming from the lacquer. The physicality is as ephemeral as the radio ether. 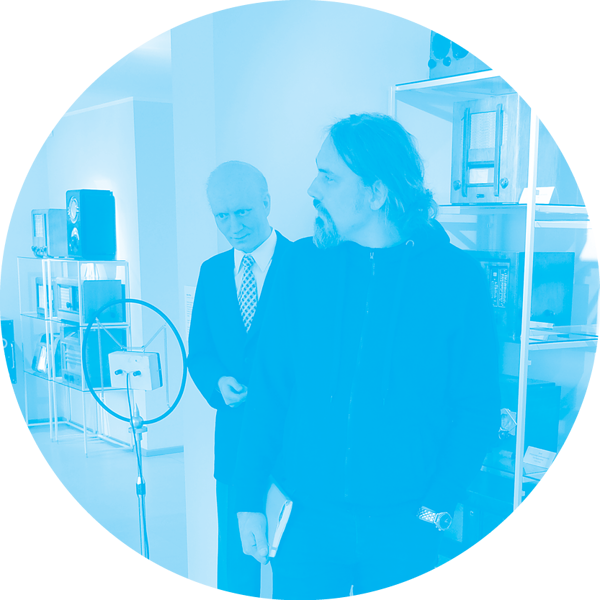 The recorded sound copy – unique and ephemeral – will supplement the exhibition introducing the work process of the acetate disc turntable Saja Synchron in the Estonian Broadcasting Museum’s permanent exhibition. The authors therefore bring back to life the story of one museum object, turn it alive for a moment and write a new chapter to its story. * This is an object from the collection of the Estonian Theatre and Music Museum given to the custiodianship of the Estonian Broadcasting Museum. ... graduated with MA in Interactive Multimedia from the Estonian Academy of Arts. His oeuvre focuses on location-specific sound installation, performance, improvisation, DIY-culture, text, videophonic and radiophonic art. Keller is part of several collective platforms — he is the founding member and manager of Dynamic Union of Music and Arts (Estonian: Muusika ja Kunsti Dünaamiline Koondis); member of the experimental electronic music group Eesti Elekter (English: Estonian Electricity) (with Taavi Kerikmäe, Tõnis Leemets, Maike Lond, Heikki Tikas and Kalle Tikas) and of the free improvisation noise duo Post Horn (with Hello Upan); founder of the radio art festival Radiaator (with Katrin Essenson); he has given concert performances of radio art with LokaalRaadio (Katrin Essenson and Hello Upan). In addition, Keller is part of artist group MIMproject and has performed as a solo artist under the name Paul Cole, performing burlesque Americana rock. Since 2014 Keller works at the Estonian Academy of Arts as the department head and professor of New Media. The museum’s permanent exhibition reflects the history of broadcasting since the first transmitting attempts. Visitors can see and compare the radio receivers and technology of different eras that was used to produce and transmit television and radio programs, and learn about the development of broadcasting in the Estonian language. Raul Keller’s museum residency was from 23 April to 1 May 2018. The residency was supported by the Estonian Broadcasting Museum. 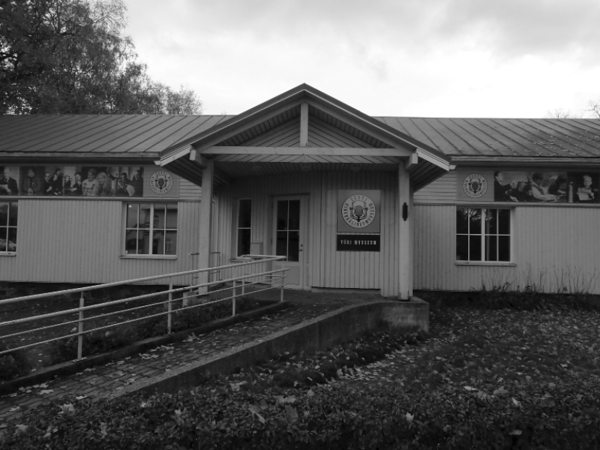 Here are the photos from the visit to the museum in fall of 2017 where the broadcasting museum’s director Juhan Sihver gave us a very interesting tour.